conversation between the artist and Jia Tolentino at 3 p.m.
Brooklyn, NY, February 20, 2019: The Esopus Foundation Ltd. is pleased to announce the publication of Neil Goldberg: Other People’s Prescriptions, the first volume to be published under the nonprofit organization’s Esopus Books imprint and the first monograph of work by the New York City–based artist Neil Goldberg. The 80-page, 13″-by-10″ book, which includes an introduction by Pulitzer Prize–winning author Louis Menand, will be launched at Artbook @ MoMA PS1 on Sunday, April 28th, from 2 to 4 p.m. During the event, Goldberg will discuss the book and his artistic practice with The New Yorker writer Jia Tolentino. Over the past 25 years, Neil Goldberg has created a remarkable series of artworks (including a project for Esopus 8) that incorporate photography, video, installation, mixed media, and performance to explore embodiment, sensing, mortality, and the everyday. New York—in particular, the rituals, gestures, and accoutrements of its inhabitants—has always played a major role in his work, and the city features prominently in Other People’s Prescriptions. This perfect-bound book comprises 40 color images from Goldberg’s recent photographic series of the same name, the subjects of which are bespectacled New Yorkers photographed from behind to afford viewers a glimpse of the city through their corrective lenses. 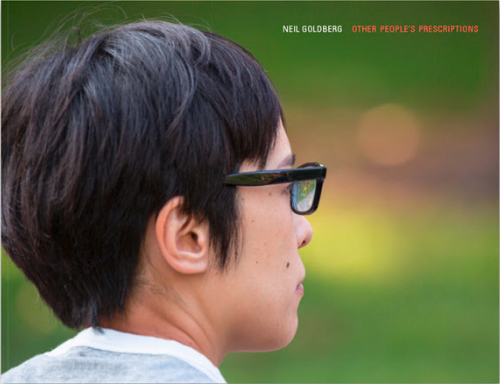 Other People’s Prescriptions employs the congenial voyeurism that informs so much of Goldberg’s practice. Whether his (often unwitting) subjects are perusing the contents of a bodega’s salad bar, emerging from a subway, carrying groceries, or checking an email on their iPhone through bifocals, Goldberg manages, through his trademark combination of conceptual rigor and deep empathy, to celebrate their humanity while inspiring us to recognize our own.